Is January really almost gone? I really thought that things would slow down after the Christmas holidays but oh how wrong I was! With the new job, days have gone by in a blur. Most of the time I’m meeting new people, learning new systems, products and before I know it, it’s past seven or eight in the evening. At times my head’s just spinning with so much new information that I long for the day when everything “just clicks”… The good news though, as nerdy as it sounds, is that I’m enjoying it all. I feel lucky to be where I am now. Then there’s my other project. In between work, I’ve also been getting our house ready for auction. We had it painted and did a little bit of cleaning and styling, and by the time it was done, I was almost regretting leaving. In fact, the photographer said it was the most photogenic house he had seen in a long while. So really, there isn’t much time for anything else. Blogging has continued to take a backseat for the moment, especially, as I mentioned before, being able to visit some of my favourite blogs. Even the recipes now that appeal to me, are the ones that require minimal effort on my part. 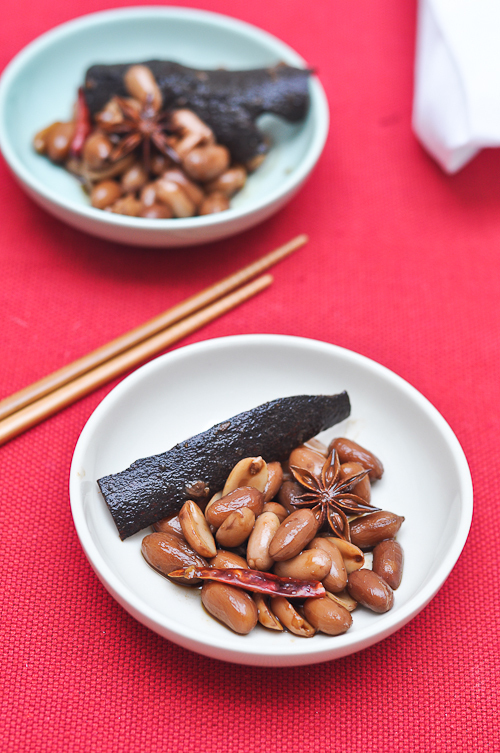 Take these Chinese Style, also known and Fragrant Braised Peanuts, I made the other day, which also coincides quite nicely with Chinese New Year just around the corner. 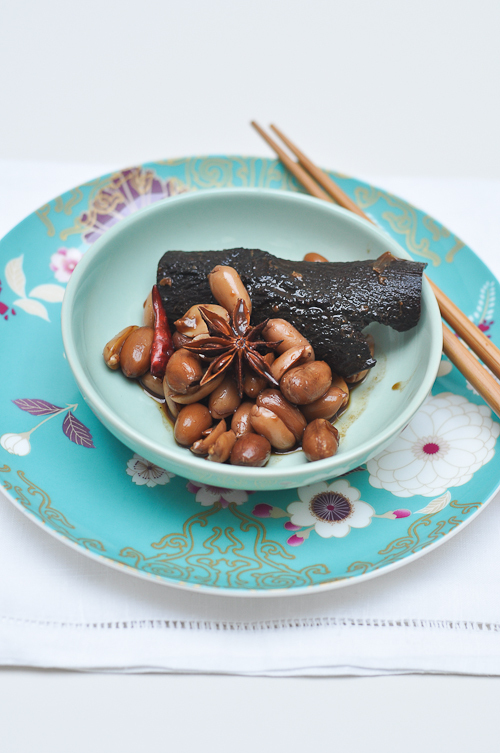 The inspiration for them came during one yum cha lunch with my family where I polished off the braised peanuts that came with the roast duck and soy chicken. As I nibbled on them I thought they tasted like they had been cooked in a traditional Chinese red braising liquid and that there probably wasn’t much to making them. Sure enough, this tasty snack takes nothing more than placing all ingredients in a pot and allowing to simmer for a few hours. 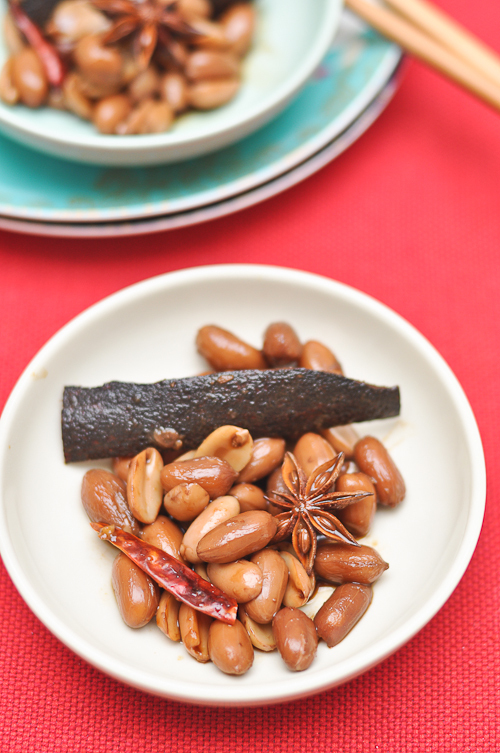 Peanuts braised in soy, star anise, cassia, garlic, chillies, sugar and hints of citrus, the result is a myriad of lovely and addicting flavours. Combine all ingredients in a large pot with eight cups of water. Bring to a boil and then turn the heat down so that the braising liquid is just simmering. Add some water while cooking if necessary (I added around two cups each hour I boiled the peanuts). Cook for around two and a half hours. Remove the peanuts from the heat and place in another container. Allow the peanuts to cool before storing in the refrigerator.